Welcome back to another week of the Love to Learn Linky! 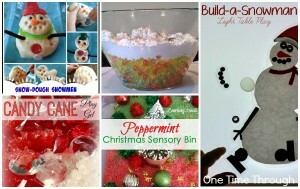 There are so many fun Christmas sensory ideas in my brain right now – and not enough time to share them all with you. So, instead of trying to, I created a Christmas Sensory Mix and Match Activity Planner that you can use to create your own fun experiences at home! Here is a picture of the planner. To use it, all you do is choose one (or more) options from each box to create a new Christmas sensory activity. For example, you could choose playdough with a Rudolph the Reindeer inspiration. Make brown playdough and add in a red pompom for a nose, and some glass beads for eyes. Maybe some brown pipe cleaners for antler-making. If you wanted its purpose to be exploratory, I’d just add a few playdough tools to cut and roll with and leave it at that. We’d also probably read a version of the story before play for extra inspiration! Isn’t that easy? Ever since I made this planner, I’ve been using it myself. LOL. I hope you find it as useful for stimulating ideas as I have! Homemade Playdough – Find my awesome downloadable recipe in our Free Printables page. Coloured Rice – Find the super-easy instructions for colouring rice (without rubbing alcohol!) at the bottom of our Spring Sensory Bin post. Coloured Salt – All you do is mix some food colouring into household salt! Slime – Find a fun Christmas recipe for slime at Growing a Jewelled Rose. Cloud Dough – Find the recipe for cloud dough along with other sensory ideas in our 10 Sensory Ideas for When You Only Have 10 Minutes post. Snow Dough – Gradually add 1 1/4 cups water to 2 cups of Baking Soda and 1 cup of Cornstarch, stirring the entire time until you have a moldable dough that can then be chilled in the fridge. Coloured Pasta – Follow these easy instructions from Powerful Mothering for brightly coloured noodles. Oobleck/Goop – Find instructions and ideas for play in our Rainbow Goop post for this sensory material that is part liquid, part solid. 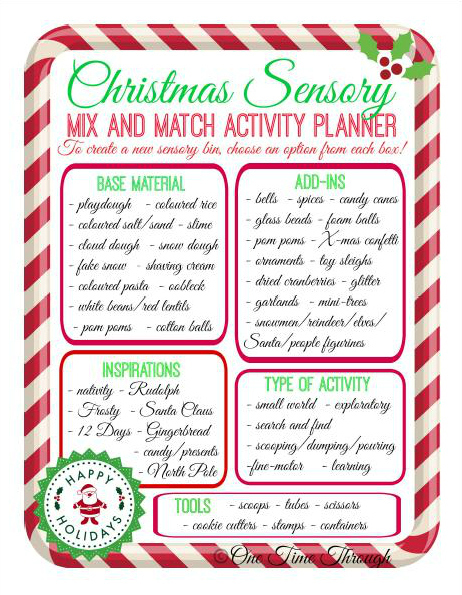 To get your FREE copy of the Christmas Sensory Mix and Match Activity Planner, click on the photo above or here to take you to our Free Printables page where you can download it! And now for our features from last week’s Love to Learn Linky! Here are 5 really creative ways that kids can get their Christmas sensory kicks! Snow Dough Snowmen and Christmas Trifle Sensory Play from Multicraftingmummy. Snowmen on the Light Table from Where Imagination Grows. Candy Cane Play Gel from Science Kiddo. Christmas Peppermint Bin from Learning 2 Walk. That’s it for today’s CHRISTMAS SENSORY resources. 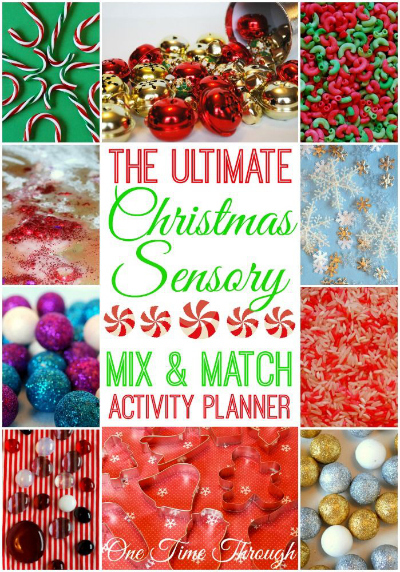 I’d love to hear what you think about the new mix and match Christmas sensory activities planner – and if you used it – what you came up with! Leave a comment below or share a picture on our FB page. If you’re looking for even more fun Christmas ideas for kids, be sure to check out our Pinterest board at: Follow One Time Through’s board Christmas on Pinterest. Now it’s time for some more links! I hope you’ll join me and a few of my friends for a brand new linky party. Left Brain Craft Brain (leftbraincraftbrain.com): Anne is an ex-engineer, current stay-at-home mama writing about crafty ways to encourage creativity (and brain power!) in our kids. Each of her projects gives kids the chance to learn about a new subject and do something crafty at the same time. Totschooling (totschooling.net): Viviana is a blogging mom to a toddler and a preschooler, sharing ideas and resources for early education. She specializes in unique, hands-on printable activities that are educational, fun and inspire creativity in young minds. A Little Pinch of Perfect (alittlepinchofperfect.com): Katie combines creativity, play, and learning for the perfect mishmash of fun activities that keep kiddos entertained throughout the day. She wholeheartedly believes in the power of play and feels that all activities naturally provide a fun way to learn. One Time Through (onetimethrough.com): Sue is an Elementary School Teacher currently on leave to be at home with her preschooler son. She shares ideas for connecting and learning with kids through meaningful, play-based activities that nurture curiosity and creativity. 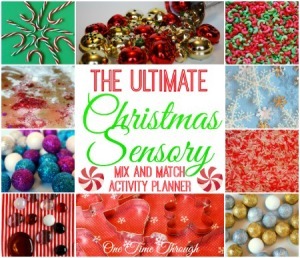 Sensory plays you included look great for Christmas, pinned! Love love love this!!! So useful. There are definitely days when you need a planner to help the activity fun flow. Hi Sue! I love love all these ideas and recipes! The planner is fantastic! Lots to keep my two little monkeys busy with in the coming weeks!